Adira of Aberlorne is an original concept bought to life from Polly’s imagination. Polly wanted to present a strong female character who was in keeping with her love of Sci-Fi, fantasy and the post-apocalyptic genres of film and literature. 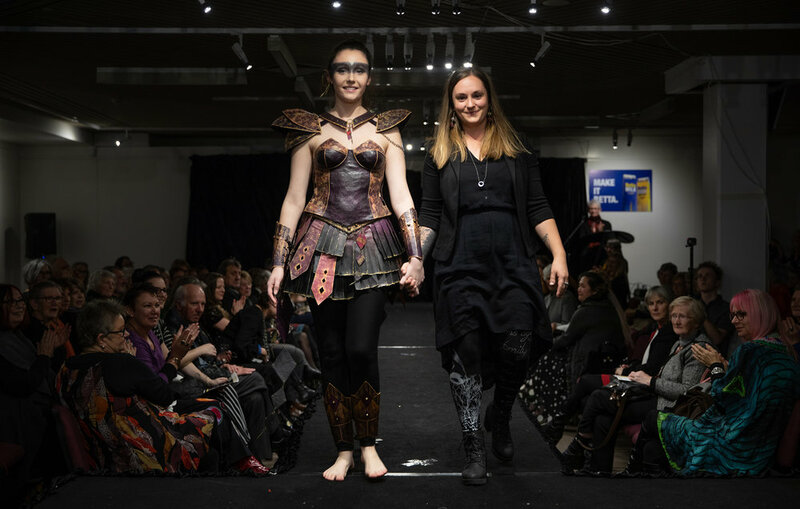 Her artist statement explains: ‘…drawing inspiration from a post-apocalyptic world, Adira of Aberlorne explores the female protagonist, embodying the spirit of a warrior. The application of papier-mache over a dress mannequin allowed me to create the bodice armour in a seamless manner and through the experimentation with handmade paper, the idea for the diamond cape was born. In Runes, the diamond shape represents The Fertility God, meaning “the fire within”. I feel this works well the theme of the female warrior, as it is the fire within that gives her the strength and courage she needs to survive’. Polly approached the making of Adira of Aberlorn’ with a sustainablility ethos. Most of the materials used, for example, Polly already had in her studio at home. Materials: Handmade paper (with some butchers paper) textured and strengthened using papier-mache techniques. Diamond shapes of the cloak strengthened and sealed with wood glue. Eyelets, clips and metal rings used to attach and connect various components. Polly is a Queanbeyan based textile, graphic and visual artist. She grew up in a family of creatives on the Far South Coast of NSW and was constantly experimenting across a range of mediums, from ceramics and textiles to painting and drawing. Polly’s first exhibition credit was in 2005 when she was in year 12. There have been many more since then! Polly’s CV also highlights a diverse range of experience across the arts. With her multi-disciplinary background, Polly has been involved with arts projects around the country. Various roles have included Curator, Co-ordinator, Costume Assistant and Stage Manager. Polly has studied Fashion Design and Visual Art, leading to her opening a small business in 2015 specialising in screen-printed clothing made from natural fibres. Polly’s current ‘day job’ is working as a Costume Assistant for TV and Film. 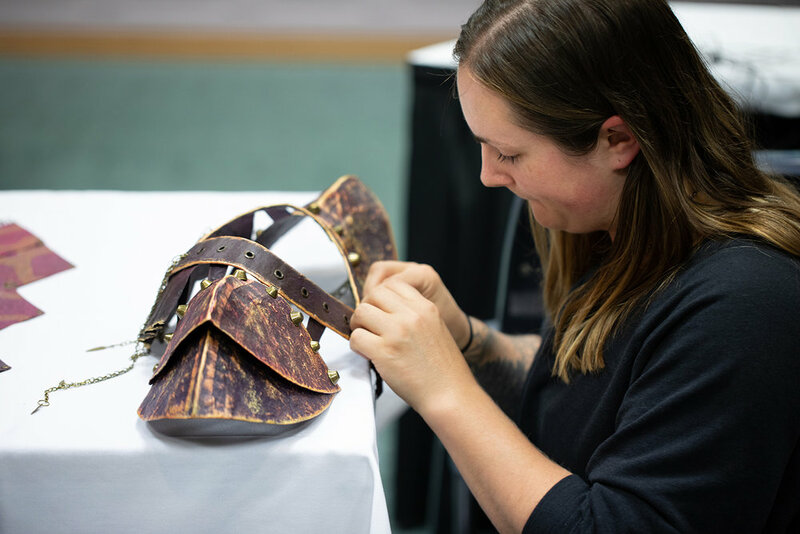 This provides Polly with daily, time-pressured insights into the challenges of ‘wearability’, and no doubt influenced her approach to the concept of Adira of Aberlorne.